Each month the DT has been showcasing one of our gorgeous twine colors along with a packaging item. 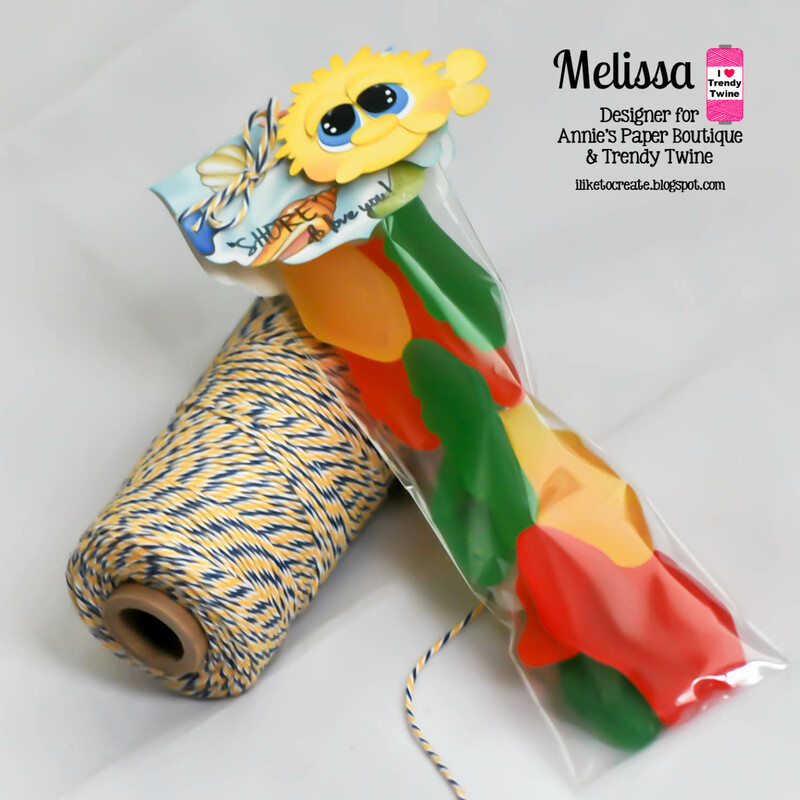 This month the Trendy Gals have been spotlighting a must have summer twine color~ Nautical along with the Medium Candy Bags. For those of you who love to make treats then make sure to stop on by the Trendy Twine store to grab some of these candy bags. There are so many projects you can use them for and people LOVE to receive some decorated treats!! Since making treats is one of my FAVORITE things to do (I know I say that often...LOL) I have another sweet idea to share that is super easy to replicate...Lets take a look! To make my treat, I grabbed some Hershey Chocolate Nuggets and wrapped them in pattern paper from My Minds Eye~Moments paper pad. Next I used the Just Tags die from My Creative Time to make the tag topper for my treat. I die cut navy cardstock for the base and matching pattern paper for the top. I stamped my sentiment and die cut the adorable beach ball in the matching Nautical Trendy Twine colors. Here is a close-up of the tag at a different angle. Once my tag was all put together, I attached it to my Medium Candy Bag by punching a hole in the bag and threading the twine through. Then tied a bow and this sweet treat is ready to be given to that special friend! I hope you have enjoyed my project and have a great Thursday! 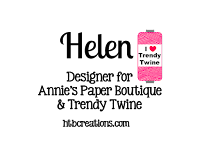 I'm Helen from from HTB Creations. 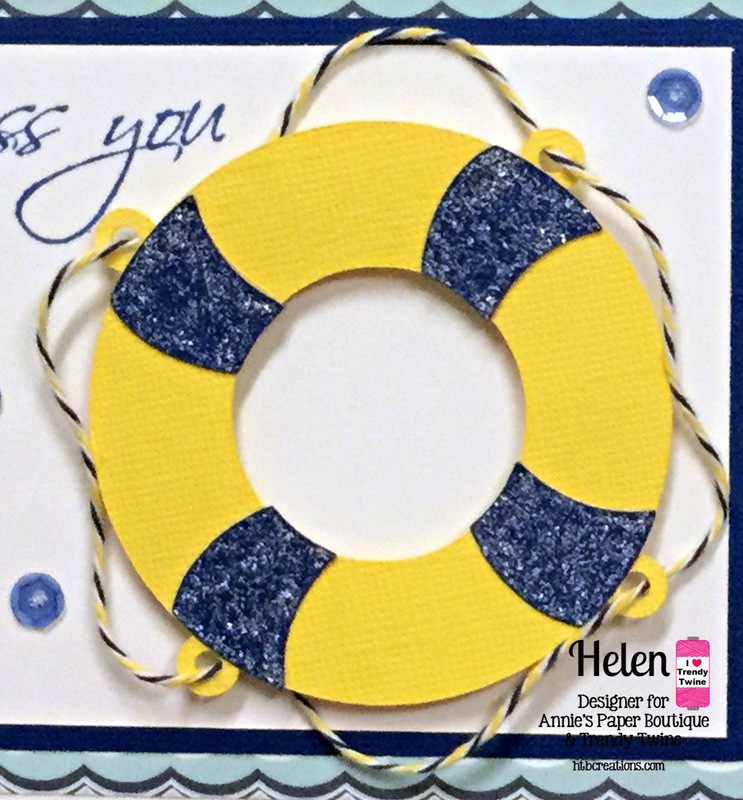 Today I have a quick card for you showcasing the fabulous Nautical Trendy Twine. This is a fabulous color combination! I found this fun life preserver Cricut cut that went along with our theme. The Nautical Trendy Twine was perfect for the 'rope' that goes around it. I threaded the twine through, taped some on the back, and did glue two spots right on the sides. I love how it turned out! The wave paper came from a beachy/ocean theme 6x6 paper pad. It was perfect! 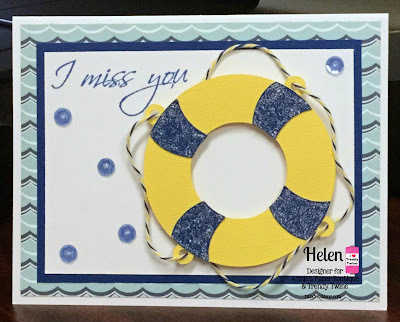 I don't have any beachy stamps though and went with the I miss you sentiment. Then I finished off the card with some sequins. Make sure to visit Annie's Paper Boutique for all your twine and packaging needs! I used some AWESOME Nautical Trendy Twine to make this fun shaker card! I made a circle shaker and added the Nautical Trendy Twine to frame the shaker. I filled the card with some blue and yellow sequins. Lastly, I topped it off with some adorable flip flops! A Happy Hello to all of you this Sunday morning!!! This is Melissa from M Miranda Creations. 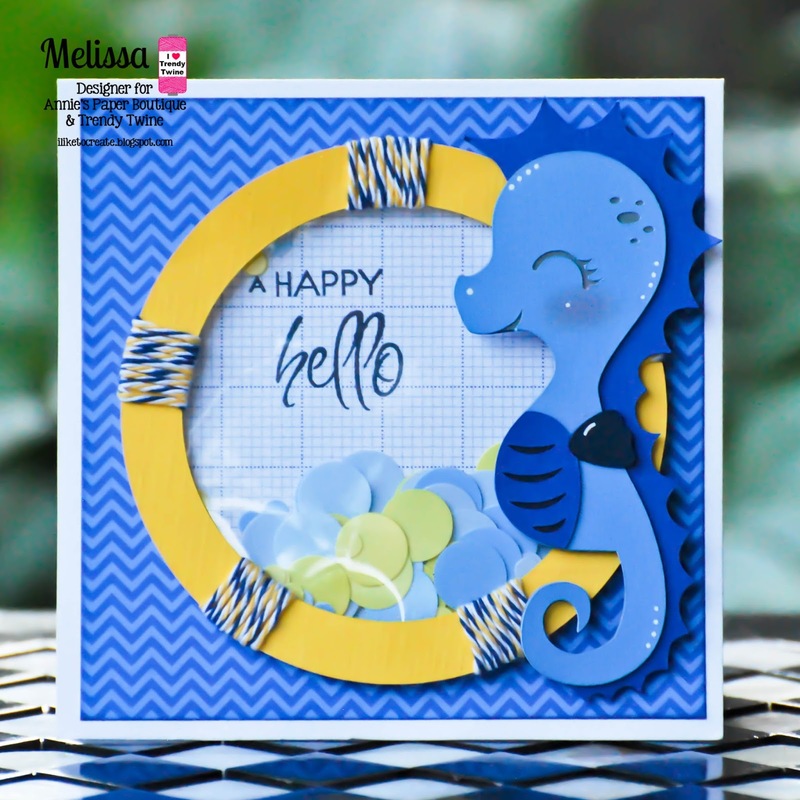 All month long the Trendy Gals have been sharing projects using the Nautical Trendy Twine and some of the ladies have been sharing a Shaker Card. This is my first ever Shaker Card. I learned several things putting it together; but overall, I am pretty excited about how it turned out. To showcase the Nautical Trendy Twine, I wrapped it around the porthole to decorate it. Thank you for dropping in today to see my last post as a Design Team Member for Trendy Twine. Yes, it is a Sad Goodbye to all my Trendy Gal Sisters and all the Trendy fans!!! Thank you, Lesley, for a wonderful time designing for you!!! It has been an incredible 11 months!!! 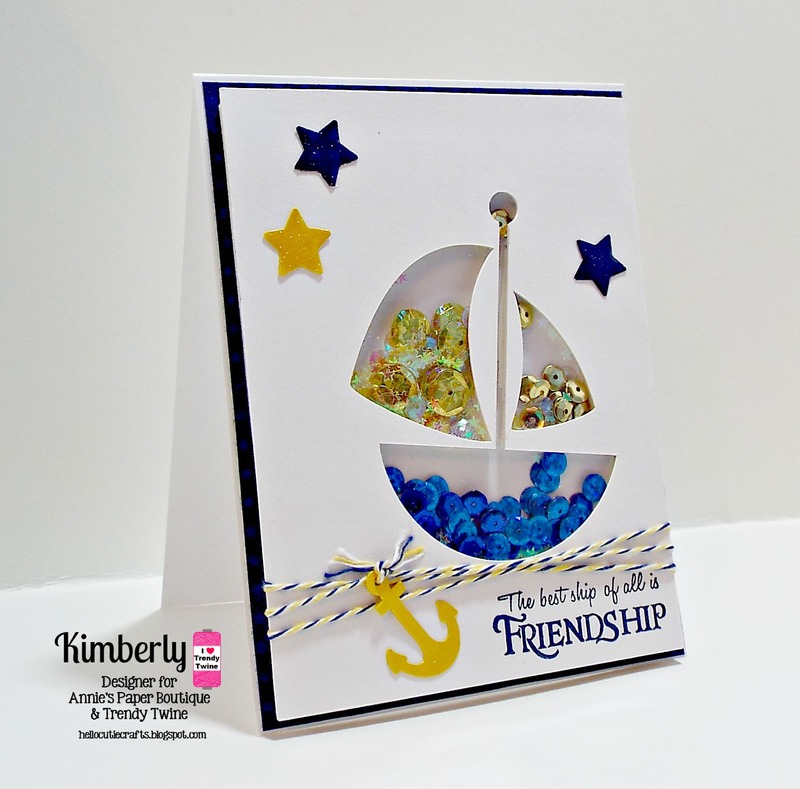 It's Tammy, and I am sharing a card with you using our spotlighted Nautical Trendy Twine. You still have a few more days to pick this up at the sale price. 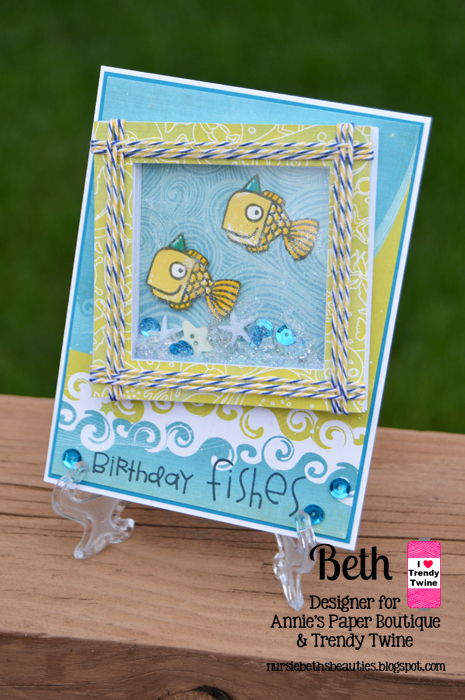 I started this card with a Kraft card base onto which I added and layered designer papers. To soften things, I added a paper doily. I took a length of seam binding ribbon and wrapped it around the center of the card face and tied in a bow. I embellished further with a button and a double bow of Nautical Trendy Twine. I then took a length of Nautical Trendy Twine and wrapped it around the card front several times for added visual interest. Lastly, I stamped a mason jar which I shaded with copic markers. I stamped and added a label for the greeting adding a set of cute blueberries which I added a touch of glitter to. This sums it up for me today. I've had the pleasure of sharing this awesome Nautical Trendy Twine with you this month, and I hope you have enjoyed seeing all our projects. Trendy Twine - Beach Day! On my previous Trendy Twine post (Here), I mentioned that I will be attending a kid's birthday party which I will be making a few of the beachbound treat bags with gumballs that was posted. I also wanted to make treat bags and fill them with stickers for those that cannot have candy. I started with a tag from the TBBM cartridge. I used a Spongebob die cut that was given as a freebie. I gave him googly eyes and adhered him onto the tag. I added starfishes and the caption "Beach Day". I filled the medium candy bag with Spongebob stickers. Cool, right? I wrapped the Nautical Trendy Twine around the tag and made a fun bow on the top. Here is a closer look at the super cute tag with the Nautical Trendy Twine. 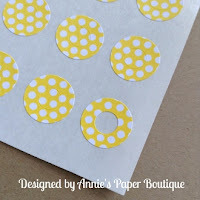 I also used the Trendy Page Dots (Yellow & White Polka Dots). For more details on my project, please stop by my blog. 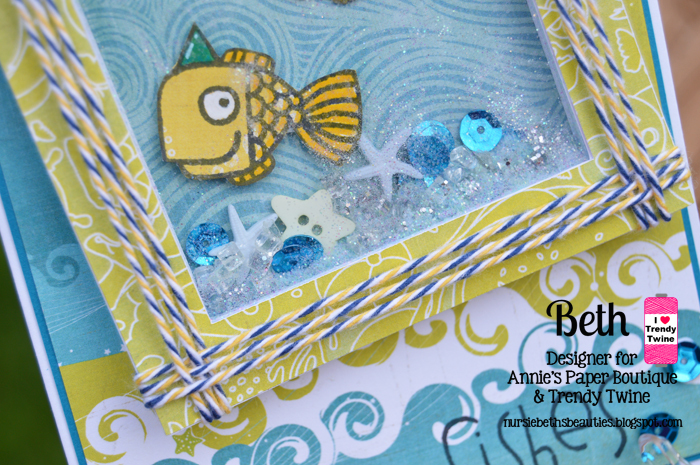 Today I am sharing a beach themed shaker card with some Nautical Trendy Twine. Shaker cards are always so fun to make! I used a sailboat from an svg and just used the negative space to make the shaker window. I filled the two sails with 2 different gold sequins and the boat with blue sequins and star sequins. 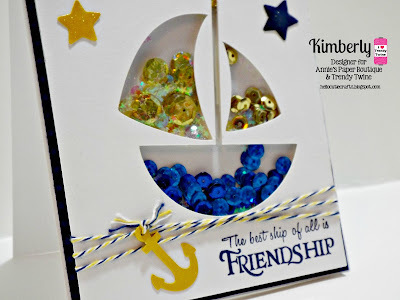 The sentiment is so fun and perfect for this kind of nautical themed card. Then add some Nautical Trendy Twine and an anchor for the perfect touch! this month featuring the Nautical Trendy Twine. Since making treats is one of my FAVORITE things to do, I have a sweet idea to share that is super easy to replicate...Lets take a look! I usually make these treats using the Medium Candy Bags and add acute tag to the top. For my project today I wanted to change it up a bit to show you another way to decorate these. Since we are sharing beach themed projects, I knew the adorable anchor and sentiment from My Creative Time would be a perfect compliment. To make my treat, I grabbed some Hershey Chocolate Nuggets and wrapped them in pattern paper from My Minds Eye~ Now and Then collection. Next I cut a piece of navy cardstock to slip into the Medium Candy Bag and to hold my chocolate nuggets in place. I was able to fit 6 in there perfectly! 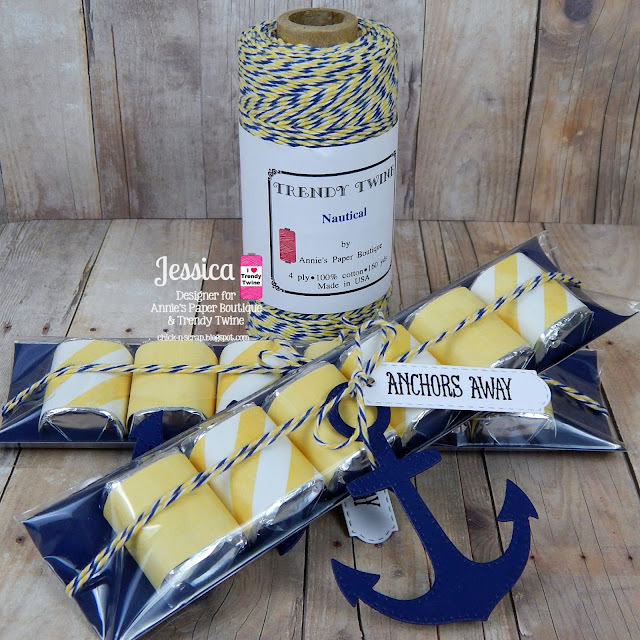 After die cutting my anchor and tag, stamping my sentiment, I took my Nautical Trendy Twine and wrapped it around the Medium Candy Bag 2 times. Attached my anchor and tag to the twine then tied it all together with a bow. Don't you think these would make fun beach party favors or a cruise night treat? I hope you have enjoyed my project and have a great Monday! Hello everyone! Beth from Beth's Beauties, and for my post today I made this punny shaker card featuring Nautical Trendy Twine. I really had a lot of fun choosing the papers and embellishments to create it! I used the Nautical Trendy Twine to create a woven frame around the shaker area. I filled the shaker with sequins, glitter, star buttons and crystal pieces. The stamp set I used for the fish and the sentiment are from Paper Smooches' Birthday Buddies stamp set. The papers are from Echo Park's Paradise Beach. 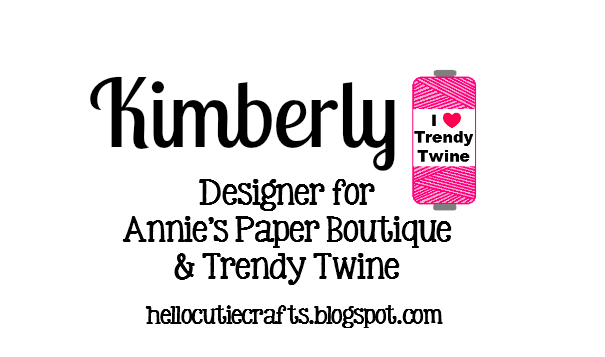 Trendy Twine - Shore Do Love You! Medium Candy Sacks and the Nautical Trendy Twine. 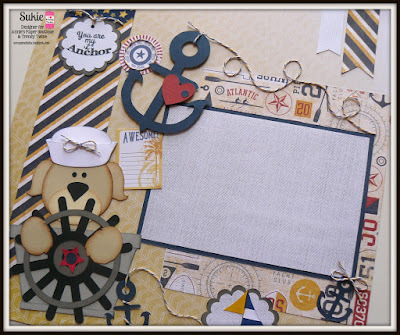 It has been so much fun seeing all the Trendy Gal's Nautical projects. I filled my candy sack with some Swedish Fish. Such a yummy gummy candy treat!!! The topper was made with some fun supplies including the Nautical Trendy Twine. I think the Puffer Fish is too cute with his big blue eyes. You can find more details on my blog post here. Thank you for dropping in today. I hope you will stop by Annie's Paper Boutique store for all your Trendy Twine and other paper crafting needs. 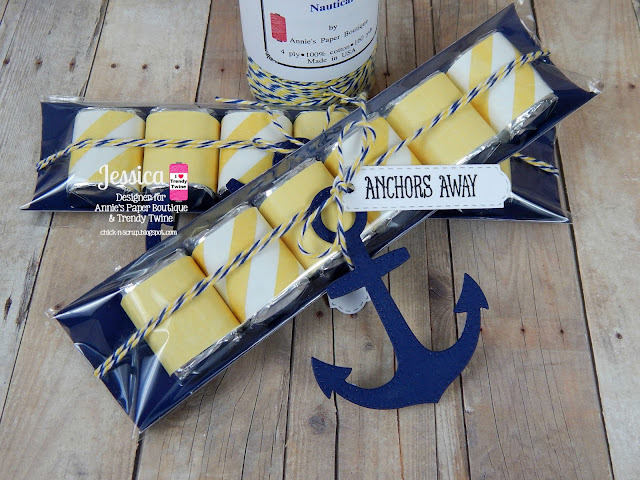 This is Shelly from My Paper Love sharing some fun treats showcasing Nautical Trendy Twine and Medium Candy Bags. I just love the candy bags, they can be used for so many fun treats as our DT has been sharing some fabulous inspiration. I created some treats that I can use as fun thank you's. We recently had a neighbor help us out and we thought WOW, what a life saver they were. 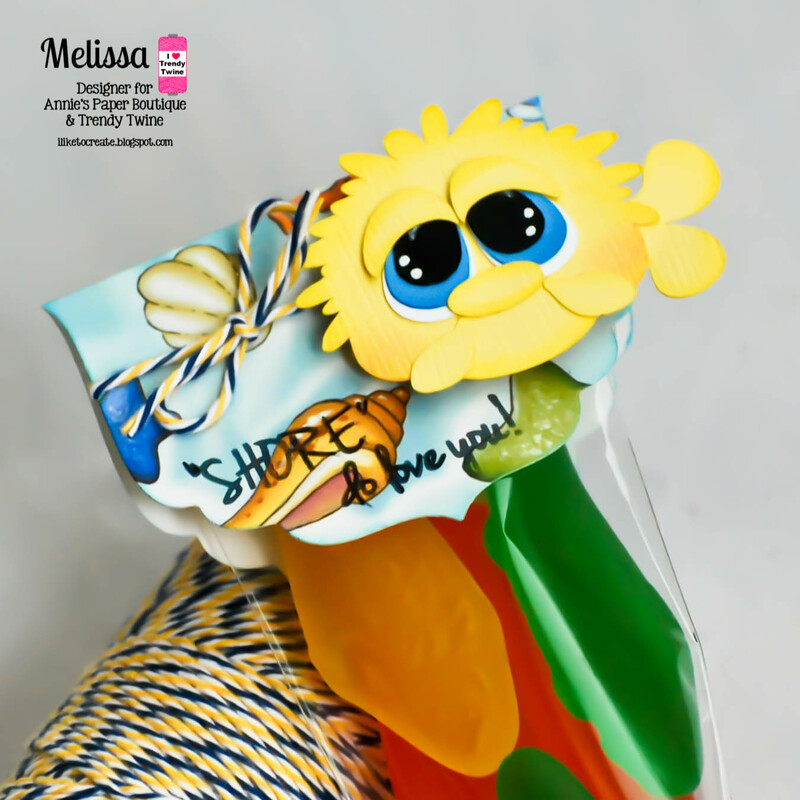 I have seen treats that use the life savers and wanted to create something fun! I started with the Medium Candy Bags and used some yellow striped paper. I cut some fun tags and anchors. I wrapped the Nautical Trendy Twine around the anchor and the bag and tied a cute little bow. Trendy Twine - A Beachbound Treat! Today's project will feature this month's spotlight, which is the Nautical Trendy Twine along with the Medium Candy Bags. For my project, I made a Nautical "beachbound" treat bag. I welded a tag from the Layered Tags 2 Cutting Files from PPPR for the topper. I used the beach umbrella, "beachbound" caption and the pail with shovel die cuts from SVG Attic's Just Beachy collection. I then wrapped the Nautical Trendy Twine around the handle of the topper and tied a little bow. I added a tiny pearl to the beach umbrella and as well as the pail. I also used the Nautical Trendy Twine on the handle of the pail. I placed a starfish brad and I filled the medium candy bag with gum balls. Yummy! I used my ATG to adhere the topper onto the medium candy bag. I will be making more of the "beachbound" treat bag for a kid's birthday party that I will be attending in a week. I am sure they will love it!!! as well as the pail (handle). Hello everyone! 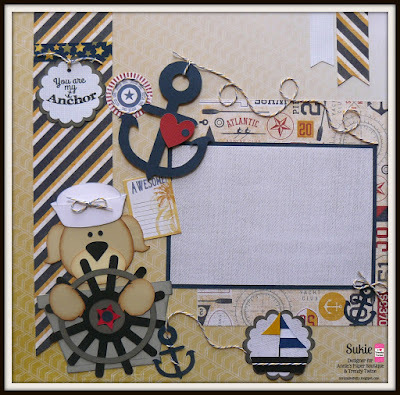 This is Sukie with a nautical themed layout featuring Nautical Trendy Twine. The twine was tied, wrapped, twisted and added to each of the paper piecings. The twine accents were the perfect embellishments for my layout. A bit of star washi was added to the large striped flag. A couple of smaller flags accented the corner of my layout page. I stamped the sentiment on a punched scalloped tag. The other embellishments all came from my stash. Pop on over to Annie's Paper Boutique to pick up this gorgeous Nautical twine for those fun summer projects. Thanks so much for stopping by and have a fabulous day! 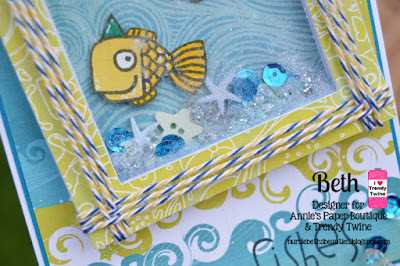 It's Tammy, and I have a fun card to share with you featuring Nautical Trendy Twine. I wrapped several back and forth rows of Nautical Trendy Twine behind an anchor die-cut to fill in the space. I took a length of Nautical Trendy Twine to the right side of the card where the pieced papers met and tied in a double bow. Then I added some foam adhesive to the back of my focal panel for added dimension and placed it on the front of the card. 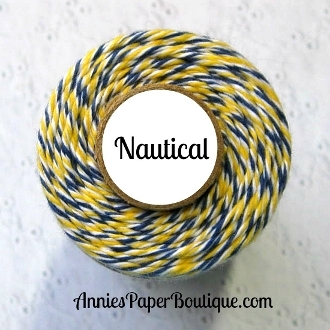 Head over to Annie's Paper Boutique to pick some Nautical Trendy Twine for your projects while it's on sale. For additional product information that I used on my card today, please visit my blog: Creating Somewhere Under The Sun. 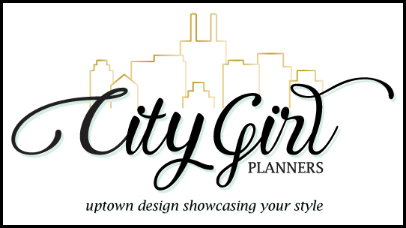 Sweet Summertime Blog Hop WINNERS! !